Aluminium Arrows have been the standard for many years and are still top performers. 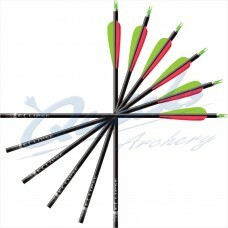 In particular archers use Aluminium Arrows at the shorter distances and on the indoor range. They are light weight and highly matched to each other for weight, straightness, and stiffness. After that it is up to you the archer to shoot them to the same standard. 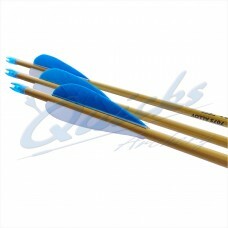 The range of price reflects the increasing robustness of the alloy used for the arrow. 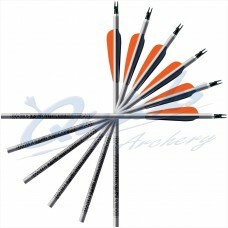 Neos basic arrows are in themselves high quality, and the XX75 tubing is a step up from there. 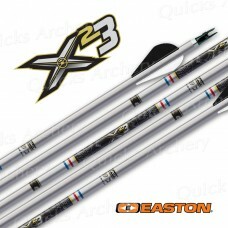 X7 Tubing is the hardest and finest arrow tubing. 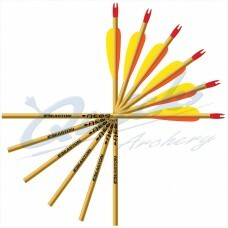 X23 Arrows are specific for indoor competition but not generally used elsewhere. Easton Neos Aluminium Arrows for Horseback Archery Specifically fletched for Horseback Archery..
Easton Jazz Arrows : Set of 12 : 1214 Spine Complete arrows per set of 12 with EN53 G Nocks..
Easton Jazz Arrows : Set of 12 : (NOT 1214 Spine) Complete arrows per set of 12 with MN25 or..
Easton Jazz Arrows : Set of 8 : 1214 Spine Complete arrows per set of 8 with EN53 G Nocks for..
Easton Jazz Arrows : Set of 8 : (NOT 1214 Spine) Complete arrows per set of 8 with MN25 or..
Easton Tribute Arrows : Set of 12 : 1214 Spine Complete arrows per set of 12 with EN53 G Nocks..
Easton Tribute Arrows : Set of 12 : (NOT 1214 Spine) Complete arrows per set of 12 with MN25..
Easton Tribute Arrows : Set of 8 : 1214 Spine Complete arrows per set of 8 with EN53 G Nocks..
Easton Tribute Arrows : Set of 8 : (NOT 1214 Spine) Complete arrows per set of 8 with MN25 or..
Easton XX75 Platinum Plus Arrows with One Piece Points Built Arrows - Ready to Shoot - per set..
Easton XX75 Platinum Plus Arrows with Nibb Points Built Arrows - Ready to Shoot - per set of..
Easton XX75 Platinum Plus Arrows with NIBB Points Built Arrows - Ready to Shoot - per set of 8..
Easton X23 Aluminium Arrows - Set of 12 Diamond polished anodised silver shafts with Super..
Easton X23 Aluminium Arrows - Set of 8 Diamond polished anodised silver shafts with Super..
Easton X7 Eclipse Arrows - Set of 12 - G Nock Sizes Top of the Range High Tensile Aluminium..
Easton X7 Eclipse Arrows - Set of 8 - G Nock Sizes Top of the Range High Tensile Aluminium..
Easton X7 Eclipse Arrows - Set of 12 - Super Uni Nock Sizes Top of the Range High Tensile..
Easton X7 Eclipse Arrows - Per Set of 8 - Super Uni Nock Sizes Top of the Range High Tensile..